Facebook today announced a change to the News Feed algorithm that will treat Pages even more like people. If one Page tags a second Page you like or follow, you may see that post in your News Feed even if you don’t like or follow the first Page. 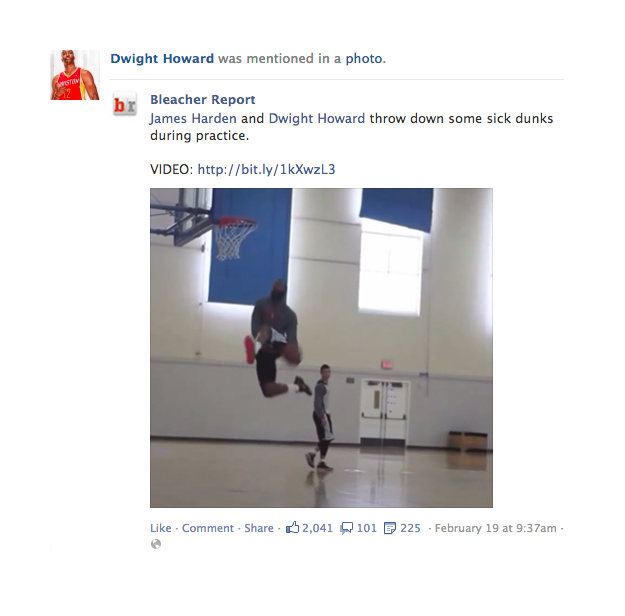 Facebook offers an example: this post below by the Bleacher Report might be shown in the News Feed to people who follow or like Dwight Howard, in addition to people who follow or like the Bleacher Report. As you can see, Dwight Horward and James Harden are both tagged in the above post. If you haven’t liked or followed either, and you also don’t like or follow the Bleacher Report, the algorithm won’t consider showing you this Page post. This is exactly how updates from friends work: if a friend tags you in a photo, your friends may see the photo in their News Feed even if they’re not friends with the person who tagged you. If you’re not tagged, your friends won’t see it unless they are friends with the person who posted the photo in the first place. Facebook says it tested this feature for Pages and found that people liked seeing this type of content in their News Feeds. The company ran surveys and found these stories received “high scores.” Now the social network will undoubtedly be looking to see how the rest of its 1.23 billion users react.